There are a variety of building insulation products on the market. They are all designed with the primary function of saving energy in homes and buildings. The basic measure of effectiveness by which all building insulation products are measured is R-Value. This is important, but it is not the only factor to consider when selecting a building insulation product. Controlling convection, radiation and air infiltration are as critical as conduction, which is the only factor R-Value measures. The fact is, insulation materials that also help seal the building envelope achieve better energy saving results. Cellulose insulation has excellent sealing characteristics that surpass many of the most common building insulation products. But it also has another important factor that surpasses all others when it comes to green building and environmental benefits. All building insulation products are all not created equal as measured by embodied energy. This is a measure of the amount of energy required to create or produce a product. Requiring more energy to create a product means more potential resulting environmental impacts. 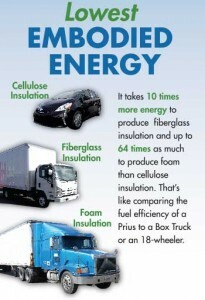 Cellulose insulation has one of the lowest embodied energy levels for building insulation products. Fiberglass insulation has up to 10 times more embodied energy than cellulose insulation, and foam insulation products up to 64 times more. This is significant when considering the mounting concerns for climate change around the world. Consumers interested in making a difference by using environmentally green products can choose cellulose insulation in confidence. It is the Greenest of the Green with the highest level of Eco-friendly benefits–and the least amount of embodied energy.